Recognised as one of the world’s leading wildlife artists, Pip has an international reputation for his oil paintings of big cats and African game. Pip first came to prominence in 2004 with his popular seven part series on Meridian Television called ‘A Brush With The Wild’, which was co-presented by Anneka Rice. The programme was filmed on location both in Kenya and at Marwell Wildlife in Hampshire, with Pip teaching celebrities such as Christine Hamilton, Linda Robson, Jenny Eclair and Nerys Hughes how to paint wildlife. Pip is the Chairman of the largest wildlife art society in Europe and has been the ‘Artist-in-Residence’ at Marwell Zoological Park in Hampshire for more than twelve years. 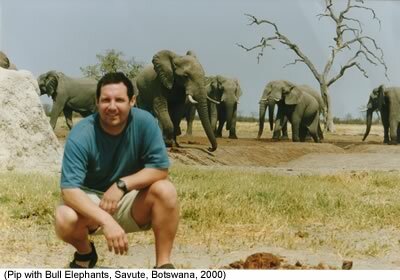 He has organized and led more than twenty safaris for wildlife artists and photographers to the remote game reserves of Northern Botswana, Tanzania and Kenya . Morer than thirty of his original paintings have been sold at international fine art auctions and in May 2008 his painting ‘Flight of the Zebras’ sold for £29,300.00 (57,985.00) at Christies in London. His recent ‘sell out’ solo exhibition at the Haddon Galleries in Torquay in 2013 produced six-figure sales with his ‘White Tiger’ portrait selling for a record £40,000.00. For the fourth year in a row, Pip has been one of the judges for the BBC ‘Wildlife Artist of the Year’ and for the last two years, the prize for the winning artist was to travel with Pip to Botswana on safari. Over sixty limited editions of his work have been reproduced by major fine art publishers, his paintings are now published in the UK by Haddon Fine Art Editions of Torquay.